- Publisher "The insights, techniques, and suggestions Dr. Ramesh Richard offers are reliable and relevant. This book is 'must reading' for all who desire to preach the word."--Dr. Charles R. Swindoll, president, Dallas Theological Seminary; chairman, Insight for Living"The Bible is what God has made. Sermons are what we make with what God has made." This is the foundation for developing expository messages, according to Ramesh Richard. His method, explained in this book, has been field-tested in training seminars for thousands of pastors and preachers around the world, and it will be invaluable to you as well.Preparing Expository Sermons is a simple do-it-yourself resource for developing and preaching expository sermons. It guides you through a seven-step process, with many practical suggestions and illustrative charts along the way. In addition, there are thirteen appendixes that include information on:o how to choose a texto preaching narrativeso understanding your audienceo elements of a competent sermon outlineo forms of sermon introductionA comprehensive sermon evaluation questionnaire is included.Ramesh Richard, Th.D., Ph.D., leads Ramesh Richard Evangelism and Church Helps (RREACH) International and teaches expository preaching at Dallas Theological Seminary. Previously published as Scripture Sculpture. Revised and expanded. 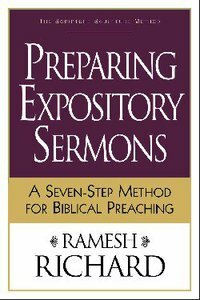 About "Preparing Expository Sermons: A Seven-Step Method For Biblical Preaching"
"The insights, techniques, and suggestions Dr. Ramesh Richard offers are reliable and relevant. This book is 'must reading' for all who desire to preach the word."--Dr. Charles R. Swindoll, president, Dallas Theological Seminary; chairman, Insight for Living"The Bible is what God has made. Sermons are what we make with what God has made." This is the foundation for developing expository messages, according to Ramesh Richard. His method, explained in this book, has been field-tested in training seminars for thousands of pastors and preachers around the world, and it will be invaluable to you as well.Preparing Expository Sermons is a simple do-it-yourself resource for developing and preaching expository sermons. It guides you through a seven-step process, with many practical suggestions and illustrative charts along the way. In addition, there are thirteen appendixes that include information on:o how to choose a texto preaching narrativeso understanding your audienceo elements of a competent sermon outlineo forms of sermon introductionA comprehensive sermon evaluation questionnaire is included.Ramesh Richard, Th.D., Ph.D., leads Ramesh Richard Evangelism and Church Helps (RREACH) International and teaches expository preaching at Dallas Theological Seminary. Previously published as Scripture Sculpture. Revised and expanded. Ramesh Richard, (Th.D., Dallas Theological Seminary, Ph.D., University of Delhi) leads Ramesh Richard Evangelism and Church Helps (RREACH) International and teaches expository preaching at Dallas Theological Seminary. He lives in Richardson, Texas.